With rising seas threatening coastal communities all across the world, FIU has launched the Sea Level Solutions Center to help people understand, adapt and persevere. FIU ecologist Tiffany Troxler will serve as director. The center combines expertise in the natural, physical and social sciences, along with architecture, engineering, computer sciences, law, communications, business, health and tourism management to develop long-term strategies in the face of rising seas. FIU’s Miami location will be key in advancing the center’s mission. South Florida is particularly vulnerable because of the large number of assets exposed to the effects of sea level rise. The FIU Sea Level Solutions Center will focus on envisioning and designing safe, resilient, prosperous and sustainable 22nd century coastal communities by focusing on the science behind the rising seas, preservation of governance systems, infrastructure challenges and solutions, business impacts, supply chain challenges, ecosystem dependencies, and personal assets. It will work with local governments, business and community leaders to accelerate adaption planning. FIU’s College of Architecture + the Arts presented Miami 2100: Envisioning a Resilient Second Century in 2014 at the Coral Gables Museum. 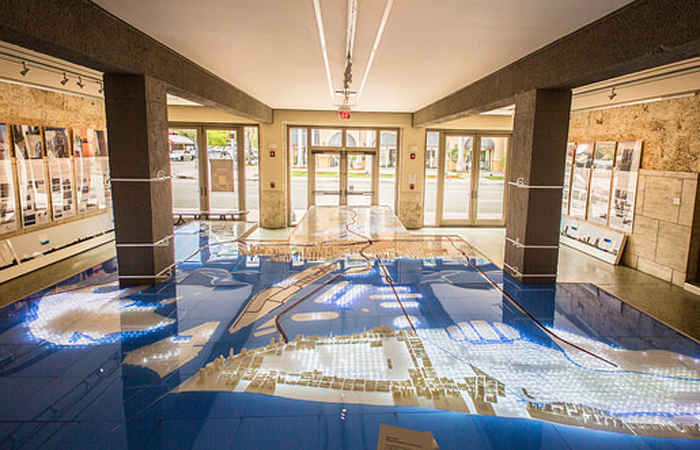 The exhibit took a comprehensive look at the topic of climate change and sea level rise, with a focus on South Florida. The center will support efforts to finance and implement plans through local, state and federal funding sources while drawing on collaborations with governments and the private sector, leveraging existing partnerships and creating new ones. The center is also dedicated to training a new generation of scientists, planners, designers, engineers, architects and communicators to develop sustainable solutions to this and other climate change impacts. FIU has been leading initiatives in South Florida to advance the science of sea level rise, including fostering strong partnerships with municipalities and other stakeholders to develop and implement mitigation and adaptation plans. The Sea Level Solutions Center will bring these multi-disciplinary efforts together in ways that will foster creative solutions to the complex issues of climate change through collaborative research, education, public outreach and engagement. Key partners in all of these activities will include researchers from other universities, the Florida Climate Institute, scientists, practitioners, business leaders, community leaders and the general public. Troxler is a research scientist with FIU’s Southeast Environmental Research Center and Department of Biological Sciences. Her research focuses on informing management and restoration of coastal and freshwater wetland ecosystems. Some of the projects she leads include collaborative efforts that examine the effects of salinity inundation on soil carbon balance in Everglades coastal wetlands. She is a national greenhouse gas inventories review expert for the United National Framework Convention on Climate Change in the Land Use, Land-Use Change and Forestry sector. Troxler is project collaborator and working group co-lead in the Florida Coastal Everglades LTER program. She works to foster local, national and international collaborative research with the aim of addressing local to global-scale sustainability challenges. Well done FIU! The focus on solutions, as the name of the new center highlights, is a welcome addition. With best wishes for success!